Click for PDF version of this report . However, in Israel and the Palestinian Authority (PA), German government funds are directly and indirectly transferred to highly politicized NGOs. These NGOs oppose peace negotiations, promote narratives that reject the legitimacy of a Jewish state, exploit human rights principles, and, in some cases, express blatant antisemitism. Churches play a central role in German development policy. Church aid organizations (MISEREOR and Bread for the World/EED), which receive most of their budgets from the German government, are major funders of politicized NGOs in Israel and the PA. Their grantees include some of the most radical political advocacy NGOs in the region. Rather than promote cooperation and peace, these groups continue to deepen the divide and further polarize societies. NGO Monitor research also shows that many recipients of German church aid funding do not have the competence to implement the official objectives or to advance German policies in the region. Analysis of available NGO financial statements and donors lists indicates that Christian aid organizations in Germany provide a significant percentage of the budgets of the specific organizations operating in Israel (71% in 2012-2015) and the PA (accurate figures not available). Zochrot (funded by MISEREOR), a fringe Israeli NGO, promotes a highly distorted narrative seeking to “raise public awareness of the Palestinian Nakba” and “recognizing and materializing the right of return,” and stressing that “the rights of the refugees to return must be accepted.” This agenda is equivalent to calling for the elimination of Israel as the nation-state of the Jewish people. Coalition of Women for Peace (CWP) (funded by Bread for the World/EED [Evangelical Church Development Service]) is a pro-BDS group that initiated the “Who Profits” campaign, an activist tool and database that identifies targets for anti-Israel divestment and boycotts. “Who Profits” is now a separate entity, also funded by Bread for the World/EED in 2015. Al Haq, a Palestinian NGO, has received funding from Bread for the World/EED, although the organization has not released financial details or donation amounts since 2009. Al Haq is a leader in anti-Israel “lawfare” and BDS. Central activities include submitting politically motivated reports to the UN Human Rights Council and other international bodies, and calling on the European Union and “relevant United Nations (UN) bodies” to boycott Israeli products. 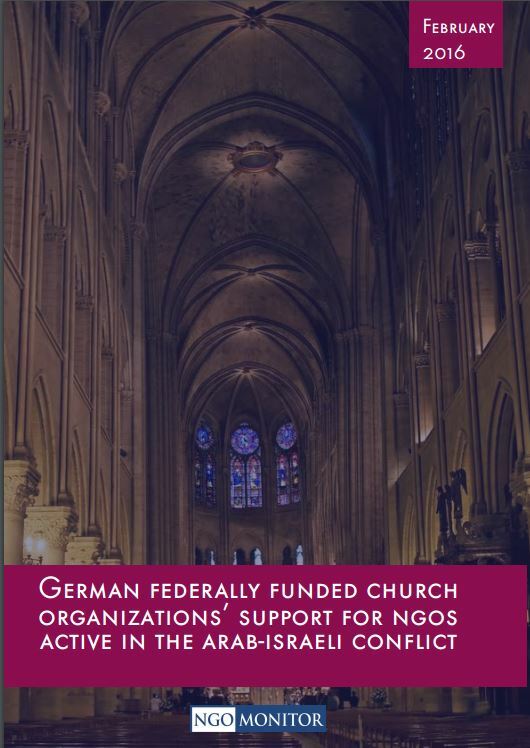 German church funding frameworks exhibit limited transparency and accountability. Most frameworks discussed in this study do not publish details regarding recipient organizations, the amounts of allocations, or information on how grantees are selected. Rather, the funding details provided in this report have been gathered through analysis of NGO annual reports and financial reports to the Israeli Registrar of Non-Profits. Further, most church funders offer no public evaluation or assessment mechanisms that would allow analysis of and accountability for the impact of the projects funded by taxpayers’ money. No funding for NGOs that promote anti-normalization and reject peace negotiations. The NGO Forum of the 2001 Durban Conference adopted a strategy of political warfare and delegitimization against Israel, using allegations of “apartheid,” “racism,” “war crimes,” and similar rhetoric. Implemented by a network of non-governmental organizations (NGOs), this strategy operates under the banners of human rights, democracy, peace, and humanitarian aid. NGOs exploit tactics such as BDS (boycotts, divestment and sanctions), and abuse universal judicial frameworks such as the International Criminal Court to target Israeli officials and block counter-terrorism efforts (“lawfare”). Much of the funding for the NGOs leading these demonization campaigns comes from European governments. The NGO campaigns actively work against the policies advanced by these same governments. In this report, NGO Monitor focuses on German church aid organizations’ support for Israeli and Palestinian NGOs that are centrally involved in this Durban strategy of political warfare. We provide systematic analysis of the activities of these organizations, their relationships with their respective German counterparts, and when possible, funding details. Germany is one of the leading countries worldwide in providing development aid. In absolute terms, in 2011, Germany (€10.2 billion) was the second largest bilateral donor after the United States. Germany committed itself to increasing its development assistance allocation to 0.7 per cent of gross national income (GNI) in 2015. Some of this German funding for NGOs is then channeled via church-based aid groups and powerful political foundations associated with German political parties. The two main church-related organizations that are active internationally and receive funding from BMZ are Bread for the World/EED (Brot für die Welt – Evangelischer Entwicklungsdienst, EED), associated with the Protestant Church, and MISEREOR, associated with the Catholic Church. Both have been working for 50 years within the framework of German development cooperation ostensibly to ease poverty and enhance living conditions. VENRO’s current CEO, Dr. Bern Bornhorst, is head of the “politics and global issues for the future” department (PGZ) at BfW/EED. His deputy at VENRO, Dr. Klaus Seitz, is head of the political department in MISEREOR. As indicated by their titles, the two are responsible for political lobbying for their respective organizations. These two German church aid organizations often do not promote peace: they partner and fund politicized NGOs that advocate for BDS (boycott, divestment, and sanctions) campaigns against Israel, manipulate legal systems to demonize Israel, and single out Israel internationally. During the wave of stabbing attacks on Israeli civilians by Palestinian perpetrators that began in October 2015, NGOs funded by German church aid organizations including Adalah, Coalition of Women for Peace, Physicians for Human Rights-Israel, and Al Haq, all released statements criticizing Israeli policy and actions that killed or wounded Palestinians, without noting that these individuals were neutralized while in the middle of perpetrating terror attacks. Al Haq maintains a list on its website that records each attack as an “alleged” crime, and emphasizes that the Palestinians were killed by Israelis, as if unprovoked. Al Haq does not refer to the attacks as criminal or illegal, nor does it attempt to ascertain the identities and conditions of the Israeli victims. In this regard, the statements of Al Haq and other NGOs are inconsistent with human rights, promotion of the rule of law, and fact-finding, deny Israelis the rights to life and self-defense, and erase the many victims of Palestinian terror attacks, including children and the elderly. Bread for the World (Brot für die Welt) was founded in 1959 in the framework of the Protestant and Free Churches in Germany, within the Ecumenical Diakonia, a department of the Social Service Agency (Diakonisches Werk) of the German Protestant Church. BfW/EED shares the mission of “supporting churches and partner organizations worldwide in their struggle for improved living conditions for the poor, for justice, peace and human rights as well as for the integrity of creation!” It is a member of the Act Alliance, a coalition of churches created by the World Council of Churches (WCC). The Act Alliance and WCC both play key roles in mobilizing international BDS campaigns against Israel. Forty-eight percent of BfW funding for 2014 came from the German government’s BMZ office. In 2014 BfW/EED spent €501,100 for 2 projects in Israel and €3,592,500 for 12 projects in the PA.
BfW/EED (as well as its composite elements before the merge) engages in highly politicized activities, while simultaneously funding other biased NGOs active in the Arab-Israel conflict. In 2012, as a member of APRODEV, BfW/EED endorsed the policy of banning goods produced over the 1949 Armistice line as part of the wider BDS campaign. In July 2014, BfW/EED and MISEREOR (see below) held a conference in Berlin on “The ICJ’s Wall Opinion Revisited: Towards its Effective Implementation.” The event addressed “the impact of the wall … on the human rights of the local population, … attempt to clarify the role of the United Nations and …the role of third parties in ensuring the implementation of the legal obligations described in the advisory opinion.” The conference portrayed a one-sided picture, failing to mention that the security barrier was built in response to mass suicide bombings and other terror attacks emanating from the West Bank and has saved countless lives since its construction. Since the issuing of the International Court of Justice’s (ICJ) non-binding and entirely politicized decision, the NGO network has sought to “enforce” it by filing frivolous universal jurisdiction lawsuits, lobbying at the International Criminal Court (ICC), and using it as a basis to have EU and European governments enact BDS policies against Israel. The conference framework and the list of speakers (see below) reflect the blatant propagandistic nature of the event, as well as its exploitation of academic, human rights, and legal terminology. Shawan Jabarin, General Director of Al Haq, a Palestinian NGO leader in lawfare and BDS activities, has been denied exit visas by Israel and Jordan on several occasions due to alleged ties to the PFLP terrorist group. A June 2007 decision by the Israeli Supreme Court called Jabarin a “Dr Jekyll and Mr Hyde,” a human rights campaigner by day and a terrorist by night. Hamdi Shaqqura, Deputy Director for Programs Affairs at the Palestinian Centre for Human Rights (PCHR). PCHR accuses Israel of “ethnic cleansing,” “war crimes,” and the “Judaization of Jerusalem.” PCHR is a Leader in anti-Israel “lawfare,” including ICC campaigns; calls Hamas rockets that injure Palestinians (rather than reaching their intended Israeli civilian targets) “misuse of weapons;” and accuses Israel of crimes in trying to stop Palestinians while carrying out stabbing attacks. BfW/EED sponsored a December 2014 “Canaan Conference” in Berlin titled “Trialogue with Israel and Palestine,” which included radical NGOs Israeli Social TV, New Profile, and Café Palestine Freiburg. While the Canaan conference claimed to be “a platform for bi- and trilateral communication between women from Palestine, Israel and Germany,” it featured many inflammatory speakers, including one who reportedly declared “Zionists are racists.” Café Palestine Freiburg has previously advocated “dismantling Jewish ideology” and has been accused of stoking modern antisemitism. In a September 13, 2013 article, “20 Years since the Oslo Accords: Learning from the History of the Middle East Peace Process,” BfW blames the failure of the peace process on Israel, while failing to mention Palestinian rejectionism, violence, incitement, corruption, and the role of Hamas. BfW/EED publishes inaccurate water libels, alleging insufficient and inequitable water distribution, ignoring evidence that Israel provides Palestinians in the West Bank with more water than required under the Oslo framework and that thieves are responsible for stealing up to 50% of supplies in some Palestinian areas. In so doing, BfW manipulates and distorts water issues in order to falsely portray Israel as a brutal regime. A leader in the anti-Israel “lawfare” and BDS campaigns. The organization regularly files lawsuits and submits anti-Israel “reports” to the UN Human Rights Council and other international bodies. The Israeli Supreme Court has identified Al Haq’s general director Shawan Jabarin as “among the senior activists of the Popular Front terrorist organization.” Jabarin has been denied exit visas by Israel and Jordan on account of these alleged ties. Al Haq uses the Palestinian Human Rights Organisations Council (PHROC) as a platform to lobby international forums and disseminate statements demonizing Israel. In 2015 it published “Divide and Conquer: A Legal Analysis of Israel’s 2014 Military Offensive Against the Gaza Strip,” presenting a completely biased and distorted view of events leading to the 2014 Gaza War. 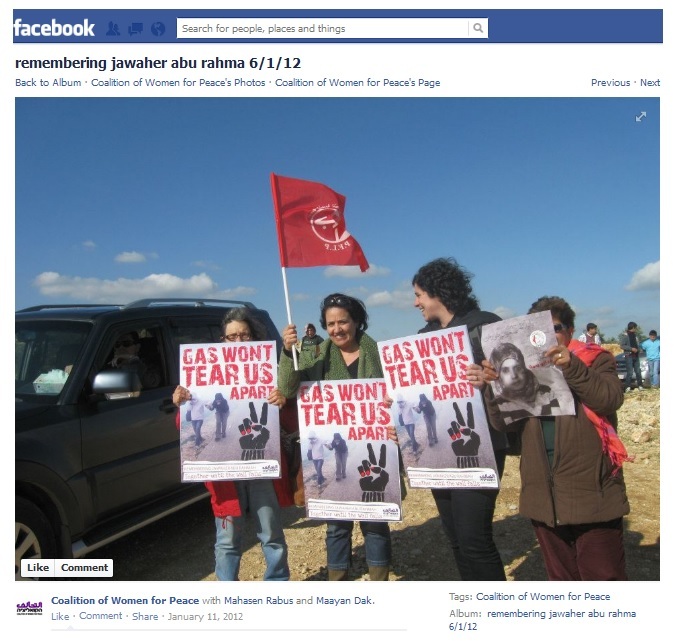 In 2013, Al Haq was part of a libelous campaign falsely suggesting that Israel steals water from Palestinians in order to interfere with cooperation between Dutch companies and the Israeli company Mekorot. A February 2012 report accuses Hewlett Packard of “direct involvement in the occupation” and uses the company as “a case study to discuss the role of international and local corporations in Israel’s mechanisms of surveillance and control over the occupied Palestinian territories.” The report completely distorts legitimate Israeli security concerns, ignoring the human rights of Israeli citizens. Opposes Israel’s right to define itself as a Jewish state and has compiled a list of Israeli laws that it claims to be racially discriminatory. Adalah employs a loose definition of “discrimination,” applying the term to laws and proposed laws entirely unrelated to Israeli Arabs or other minorities. Laws promoting Zionism and the historic Jewish connection to Israel are labeled as discriminatory. This includes laws that relate to Israel as a “Jewish and democratic state,” as well as the use of Jewish symbols and the Hebrew calendar. Adalah uses the word “Zionist” in a pejorative manner throughout the database, indicating that it accepts the “Zionism is racism” canard. In 2007, Adalah published “Democratic Constitution,” which calls for replacing the Jewish foundation of the state. In an October 2011 publication “Doctoring the Evidence, Abandoning the Victim,” PHR-I accused Israeli doctors and institutions of involvement in the “torture and ill-treatment” of Palestinians. Detailed analysis of the sweeping claims demonstrates deeply flawed research, and the Israel Medical Association denounced the highly selective publication for erasing important details. Based on faulty methodology, PHR-I asserts that Israeli security officers “routinely employ interrogation methods which amount to torture and ill-treatment” and that “medical professionals are frequently involved either actively or passively in torture or ill-treatment.” Lexical or legal definitions for “torture” and “ill-treatment” are not provided and are used inconsistently. On January 21, 2015, PHR-I published “Gaza, 2014: Findings of an independent medical fact-finding mission,” alleging Israeli violations of human rights and international legal norms during the 2014 Gaza War. The incomplete account in the actual publication provides absolutely no proof or evidence for these serious charges. To accurately draw such conclusions requires factual knowledge, considerable military expertise, as well as access to comprehensive data from both the Israeli army and from within Gaza, in particular during the fighting. PHR-I does not possess any of this information, and the NGO is unqualified to issue its conclusions. In February 2014, Jafar Farah, the director of Mossawa, presented a letter to European Parliament President Martin Schultz accusing Israel of “population transfer” and “forced displacement” and urging the European Union to take action to influence Israeli policy in the region. Mossawa features the “Homeless in Your Own Home” blog, which intends to provide “a glimpse of the daily challenges… of the Palestinian Arab minority of Israel.” The blog accuses Israel of “collective discrimination,” “home demolitions,” and denying basic rights to minority citizens. This represents a further attempt to advance the narrative that the Palestinians and Bedouin are the native and legitimate residents of the land and that Israel is a foreign, occupying power. Claims to advance “the development of planning policies and practices that are more just and respectful of human rights, and responsive to the needs of local communities,” when, in fact, it regularly politicizes and exploit the issue of the Bedouin in the Negev to wage political warfare against Israel. Bimkom’s officers also engage in demonizing rhetoric: Executive Director Hedva Radovanitz (who has worked with other advocacy groups including the Physicians for Human Rights-Israel), Bimkom and New Israel Fund told U.S. embassy officials in February 2010 “that she believed that in 100 years Israel would be majority Arab and that the disappearance of a Jewish state would not be the tragedy that Israelis fear since it would become more democratic” [emphasis added]. 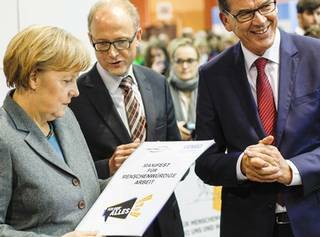 More than 60% of MISEREOR’s 2014 annual budget came from the German government’s BMZ. In 2013, MISEREOR spent €1,398,000 on NGO projects in Israel, while 2014 saw a decrease in support to €326,000 for NGO related projects. In the Palestinian Territories, MISEREOR funded nine projects at €1,357,000 in 2013 and €1,280,000 in 2014. In contrast to these stated worthy objectives, MISEREOR provides funding to highly politicized NGOs including Zochrot, Sadaka Reut, HaMoked, and the Society of St. Yves. Many of MISEREOR’s grantees play central roles in the demonization and BDS campaigns against Israel. MISEREOR claims that it “stands for transparency,” but does not provide details on amounts it grants to NGOs. Available funding information is based on NGO Monitor research and details provided by the NGOs under the Israeli NGO transparency law (2011). MISEREOR co-sponsored a September 2013 conference on “Realizing the return of Palestinian refugees.” Organized by Zochrot, the conference advocated for a one-state framework to the Israeli-Palestinian conflict. Lecture topics included a discussion on the specifics and logistics of a “return” of refugees and a talk on how “to end the colonial nature of Israel.” The logistical and demographic reality of a complete return of all Palestinian refugees from the 1948 Arab-Israel war and their descendants to modern Israel, leading to a single bi-national state, would necessarily mean that Israel, as the national homeland of the Jewish people, would cease to exist. MISEREOR helped prepare a CIDSE booklet, “Gaza Dignity under Siege: Voices from Behind the Blockade,” featuring testimonies of pro-Palestinian activists, accusing Israel of disproportionate force and abuse of power, and omitting Israeli perspectives and security concerns. MISEREOR sponsored a 2013 UN event with a panel on “Depleting Palestine: Unlawful Extraction of Natural Resources in Occupied Territory” presented by an official from Al Haq, a leader in the anti-Israel lawfare and BDS campaigns (see above). This panel was an attempt to further the BDS agenda at the UN. An Israeli NGO established with the aim of “rais[ing] public awareness of the Palestinian Nakba” and “recognizing and materializing the right of return,” stressing that “the rights of the refugees to return must be accepted.” This agenda is equivalent to calling for the elimination of Israel as the nation state of the Jewish people. Zochrot supports a “one-State solution” or a “de-Zionized Palestine,” and refers to Israel as having an “ethnicized and racialized Zionist” system. (See NGO Monitor’s factsheet on Zochrot’s Support for “One State,” May 1, 2014). Zochrot hosted a September 29─30, 2013 conference at the Eretz Israel Museum in Tel Aviv, titled “From Truth to Redress: Realizing the Return of Palestinian Refugees.” Funding for the event was provided by a number of European government frameworks. However, in response to NGO Monitor inquiries, the funders referred to issues of “privacy” as the excuse for avoiding to expose the sums and other details to the public. An Israeli organization whose main objective is “to assist Palestinians of the Occupied Territories whose rights are violated due to Israel’s policies.” HaMoked regularly petitions the High Court of Justice and makes inaccurate and inflammatory allegations of Israeli “apartheid,” “deportations,” “torture,” and “forcible transfers.” The NGO accuses Israel of “collective punishment” and the “ghettoization of the West Bank” (translated from the original Hebrew). Funding information is provided primarily by recipients in their reports to the Israeli Registrar of Non-Profits and may be incomplete. “Unknown” refers to funding data that was not listed in annual reports and not provided through correspondence with the respective funding frameworks. Adalah 2015 Bread for the world/EED 30,782 "replace the Jewish foundation Israel"
2014 Bread for the world/EED 72,478 "replace the Jewish foundation Israel"
2013 Bread for the world/EED 92,330 "replace the Jewish foundation Israel"